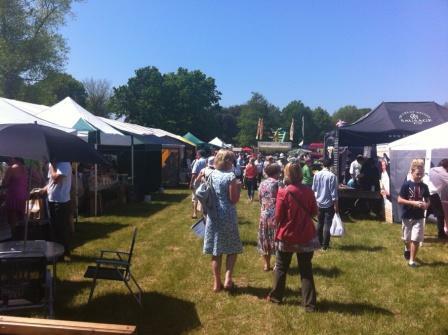 On a gorgeous sunny day in May we attended the Flavours 2012 food festival in Suffolk. They had invited the Wheat Free Woman to be a guest speaker to give a talk on gluten free. This was the first year the event had been held and it was in the beautiful setting of the historic walled garden at Henham Park in Suffolk. This is the Wheat Free Woman’s blog of the event. 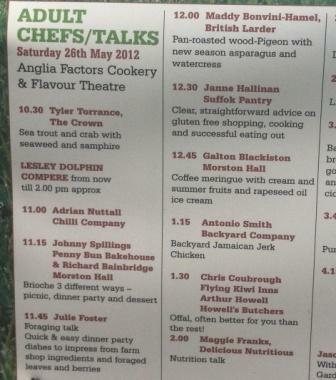 There were a series of demonstrations and talks in the main marquee, with around 100 people there when I gave my talk. I always start my talks by asking who in the audience needs to eat gluten free and who has cooked or will be cooking gluten free for others. This helps me pitch my talk at the right level. This audience had a smattering of both sets of people but was predominately just people there out of interest or having a seat waiting for the next cookery demo! If that was the case, I must have been interesting since no one left during my talk. Lesley Dolphin from BBC Radio Suffolk was Master of Ceremonies and did a lovely introduction mentioning the Great Taste Award for my Dark Chocolate Brownies with Cherries and told the audience that there would be samples of my Lemon Drizzle Cake later. Now maybe that is why they all stayed to hear me. I admire Lesley, I had been interviewed on her show when I first set up Suffolk Pantry and she made what could have been a nerve racking experience enjoyable. My talk covered the main topics I get asked so much about. Some of the basics - what is gluten, how does it affect people, how to avoid it, how to cook gluten free. An imaginary dinner party menu, making it entirely gluten free but in a way the non-gluten free’ers would not notice. This has two main benefits. It makes it so much easier for the cook and is nicer for the person who needs gluten free since they don’t feel “different” from everyone else around the table. Eating out, some tips on how to have a successful gluten free experience when eating out in restaurants. My Gluten Free Lemon Drizzle Cake went down a storm and many people took a copy of the recipe. Including Galton Blackiston, the Michelin starred chef at Morston Hall in Norfolk. So you might be seeing my Lemon Drizzle Cake on his menu. A very exciting end to an enjoyable event.